It is a common question in minds that should we wait for a coming leader/promised era? or should we focus merely on our efforts as nothing is going to happen? 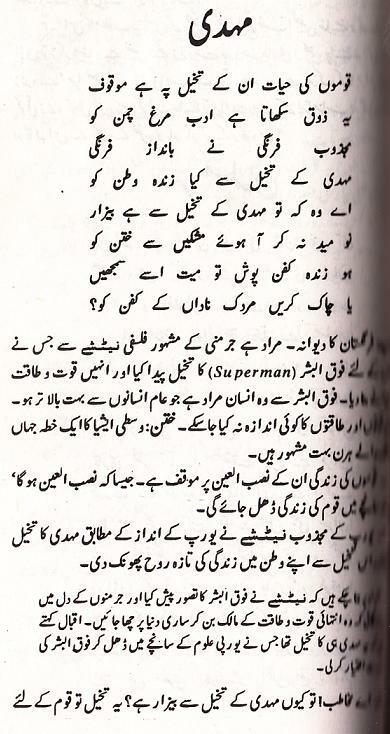 Allama Iqbal’s Poem ‘Mehdi’ is the answer of both questions. Allama Iqbal emphasized that the ‘Concept of Mehdi’ is very important for Muslim Nation and this view for Muslims has the weight that for Cathay has musk of deer. We should not fed-up from this view as the arrival of Imam Mehdi (AS) is true. At the same time we should not sit idle and just wait. In other words all our efforts should be directed. Cathay (Khatan) is the ancient name of a region in China (Central Asia) which is famous for musk producing deer and that musk is used in making perfumes/scents so Cathay’s musk adorn the world. If Musk is separated from Cathay, that region will have no weight. By this analogy, Allama Iqbal pointed the importance of ‘Concept of Mehdi’ to Muslim Nation. 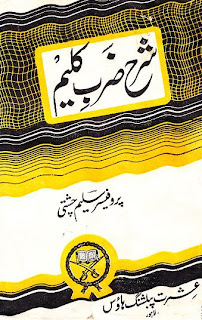 Here explanation of this poem is posted from ‘Sharah’ of two famous Iqbaliat experts, Prof. Yousuf Saleem Chishti and Moulana Ghulam Rasool Mehr. Brief description to the subject is added before the Explanation/Interpretation. English translation of poem is added at the end of this post. If residents here some zeal possess, They can explore the heights of sky. The path for birth of Superman, By valor great he strove to pave. This view for Muslims has the weight, That for Cathay has musk of deer. Or tear to pieces small and shreds, His shroud and cast away the threads? I hope, this post will answer the questions of many. 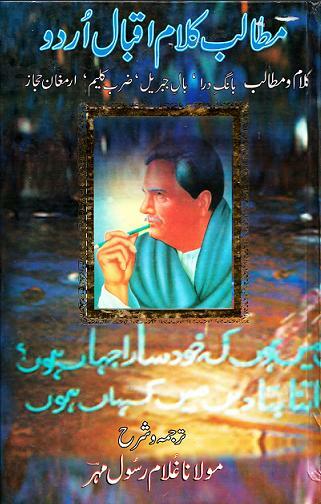 Allama Iqbal's poetry is very deep due to his knowledge and ability to see the soul in body. Pls note 'Takhiyyul' means 'Khiyal' or 'Tasawwur'. Ahoo mean Hiran (Deer). Khutan aik jagha ka naam hai jahan ke khushboo wale haren (deer) mashoor hain. yani wahan ke harnon mein mushk hoti hai jis se perfume bante hain. Khutan (Cathay) central Asia China mein hai. Another excellent post as always. This is the only reason Allama Iqbal is not taught in schools or colleges, because his poetry will change our mind and thinking. Alama Iqbal in his writing was like Ibn Khaldun was against Mehdi concept but in his poetry Iqbal more than supported the concept of Mehdi. Can I disagree with you. In his writings, Allama Iqbal wished the same thing that without a great personality, survival of this unfortunate world is very little. 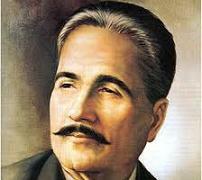 Read the letter of 3 June, 1920 in which Iqbal wished for arrival of that great personality. I think (may be I am wrong) Allama Iqbal opposed only wrong concept of Imam Mahdi which is similar to concepts of Jews's Maseeha and Shia's invisible Mahdi. These two wrong concepts say Imam Mahdi or Maseeha will have super natural powers who will come at end time and who will kill all opponents alone. It means he will appear suddenly and took control over the whole world. Dear brother Imam Mahdi (a.s) will defeat Dajjal and Prophet Isa (a.s) will kill him. Also Dajjal and Masih-ad-Dajjal (Antichrist) are different. One is philosophy and other is his representation as satanic human form. Both Imam Mahdi (a.s) and Prophet Isa (a.s) will struggle intellectually against philosophy of Dajjal which is denial of Allah. Imam Mahdi (a.s) will not kill Antichrist. Prophet Isa (a.s) will kill him under the command of Imam Mahdi (a.s). Insha'Allah. Allah Knows Best. JazakAllah for such a nice post..
May be Ashfaq Ahmad is saying some thing about pakistan. Masha'Allah very nice. He is predicting about Imam Mahdi and Golden Age in which spirituality and science will be used for humanity. Allah gave miracles to Prophet Moses (a.s) to defeat magician in age of magic, miracles to Prophet Isa (a.s) to give life to dead people and statue of birds in age of materialistic Roman pagan, and gave miracle of miracles Holy Quran to prophet Muhammad (saw) to defeat poetry, literature and coming philosophies of this age. Allah also gave other miracles to Prophet Muhammad (saw) like shaq ul qamar and Miraj in age of Astronomy. Today in age of science so Allah will give spiritual science to Imam Mahdi (a.s) who will exclude materialism from science and will explain spirituality to scientists. When science and spirituality will be combined togather after defeating materialistic philosophies then this age will became Golden Age, Insha'Allah. Today I've a dream about grave of Allam Iqbal. In dream I guided unknown person to tomb of Allama Iqbal. When we went to a room of tomb then it was dead end and there was water (river or lake) on other side of room. Unknown person said where is grave then I pointed out another room. Then we reached to grave and I sat on head or foot side (don't remember) of grave and slept. Nice words by Allama Iqbal, for all Muslim Ummah. This is such a great post for any one interested about all the spiritual leaders.Thank you.Even the comments are very informative.